This however, he claims, cannot be the only reason that the majority lets itself be used in these ways, and will indeed let itself be driven to the extent of frenzy and self-sacrifice. Einstein concludes that there must be a force within humans, a wish to hate and destroy. A force which during normal times is dormant, only showing itself in the abnormal. It can however, easily be awakened, and increased to the extent of mass-psychosis. The correspondence was initiated by the "Comité permanent des Lettres et des Arts de la Société des Nations", (The Permanent Society of Art and Letters within the League of Nations). The League of Nations was a precursor to the United Nations. The importance of these organizations in world peace is addressed within the correspondence, and the conclusions are still true today, as we now know from experience. The Society of Art and Letters wanted to encourage thinkers from different fields to correspond with each other on topics in the hope the League of Nations may benefit from it. Einstein was one of the first to come forward and was given free choice of topic and partner. He chose Freud, who agreed to participate. The correspondence took place in 1932 and was first published in 1933 in Paris simultaneously in French, German and English (the original correspondence was in German). Einstein had done some thinking on the nature of war and why it persisted throughout human history, despite its devastating effects. He wrote to Freud stating his own thoughts and asking for Freud's opinion as a psychologist. Freud replied, agreeing with most of Einstein's conclusions and adding his own thoughts on each of the issues by addressing each separately, and posing a question of his own. Einstein expresses how happy he is through the initiative of the League of Nations to correspond with a person of his choice, and that the opportunity offers a unique chance to discuss what he considers the most important question currently facing civilization with Freud. He then goes straight to the question: "Is there a way to free people from the specter of war?". He says, it has become apparent that through the advances of technology it is now possible to wipe out humankind. Despite this fact all attempts at a solution have failed frighteningly. He has come to the conclusion that people who are involved in avoiding war in practice, through their professions (e.g. diplomats, politicians, peace organizations) have reached a point, partly out of a feeling of helplessness, where they would welcome the input of people who have gained a certain amount of distance to all life questions due to their scientific work. 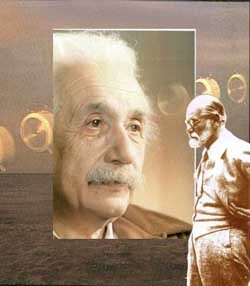 Einstein says his thinking gives him little insight into the depths of human feelings and desires. Therefore, all he can do is to pose the questions and give answers he hopes Freud can expand on, due to his "deep insight into human urges and desires". Further, Einstein hopes Freud will be able to point to apolitical ways of education that could remove psychological barriers that a normal person does not see. The only possible solution Einstein sees, is for the nations of the world to create a legislative and legal body that will be called upon in all matters of conflict that may arise between them. A sort of Supreme Court of all nations. All nations would agree to call upon this court when conflict arises and to follow the decisions and directives of this court. He is quick to point out that the first problem with any court is, that it is an institution created by people. Such a court will be all the more prone to influences from outside the court if its own power is insufficient to enforce its decisions in practice. It is a fact of life that power and the law are intertwined. The decisions of a court will be closest to the ideas of justice within the society for which it acts, the more power this society can invest in enforcing respect for those ideas. We are far from creating an organization with sufficient power to enforce the laws it decrees, Einstein says. His first conclusion is, that it will be necessary for nations to give up a certain amount of their sovereignty. It is without doubt the only way to security. So far, all attempts in this direction during the last decades have failed. Obviously strong psychological mechanisms with the human psyche are working against these attempts. Some of these mechanisms can be identified. The minority in power, within any given society, will resist any infringements upon its power. This striving for power is driven by materialistic and economic wishes. Einstein refers to the minority within any society, which will stop at nothing to gain advantages for itself and will not stop at war or weapons deals in order to increase its own power and influence. The next question arising from this is, why does the majority allow itself to be used by the minority in power? The minority stands to gain and the majority stands to suffer and to lose. (Einstein includes also soldiers in the majority, since they have joined the military in the hope to defend their country). His answer is that the minority in power rules over the schools and the press, and also has influence over the religious organizations. The minority in power uses these institutions to manipulate and channel the feelings of the masses in order to use people for their own gain. This however, he claims, cannot be the only reason that the majority lets itself be used in these ways, and will indeed let itself be driven to the extent of frenzy and self-sacrifice. Einstein concludes that there must be a force within humans, a wish to hate and destroy. A force which during normal times is dormant, only showing itself in the abnormal. It can however, easily be awakened, and increased to the extent of mass-psychosis. This seems to be the most tragic issue involved in the emergence of war. At this point Einstein refers to Freud's knowledge of human desires and urges, hoping Freud may shed more light on the subject. Then Einstein poses one last question, asking Freud whether it would be possible to influence the development of humans in a way which could make them more resistant to what Einstein calls the psychoses of hate and destruction. (Note: Freud, in his reply, points out that aggression is the opposite pole to love, and thus, is a necessary emotional force which is required for survival. He does not refer to aggression as a psychotic emotion). Einstein then notes that he does not have the so-called "uneducated" people in mind. In his experience it is more the so-called "intelligentsia" which is open to ideologies, being the kinds of people who learnt about life from paper, rather than from experiencing real life situations. Finally, Einstein comments on the fact that he has only talked about war and there are other types of human conflict. He says the reason for concentrating on war, is that it is the most extreme and destructive, and is therefore the best way to demonstrate how to prevent conflicts. It's too bad Einstein didn't live long enough to take advantage of a more scientific source than Freud. If he'd had access to current neurobiology, he'd undoubtedly have realized that most of the problem lies in the average person's mental passivity and easy acceptance of whatever reality is presented to them. The same brain wiring that makes it possible for children to be shaped by society, and thus gives societies their stability, also makes unquestioning gullibility possible. Einstein was a brilliant man. I wish he was around today to exert some influence.